FIX A LEAK is a blended concentrated material designed to seal leaks in hot tubs, spas and pools. Used to fix plumbing and shell leaks. It will seal holes up to 1/8" in diameter and form a permanent seal. Simply remove your cartridge filter, or set your sand or DE filter to "Recirculate" - add solution to the water during filtration and allow the repair to mend. You can also pour Fix A Leak directly near a suspected leak in the pool. Fix a Leak will seek out and fill voids up to 1/8". Use 8 oz(236.5 gr) per 1,000 gallons (approx 4500 Litres) for leaks in hot tubs. Use 32 oz (907.18 gr) for pools up to 22,000 gallons. Use two treatments for large leaks. Leaking plumbing, Leaking liners, all fixed with Fix-A-Leak ! 1. Bypass Filter before adding FIX-A-LEAK to water. 2. With pump running add FIX-A-LEAK slowly through skimmer or in front of any other suction intake. 3. FIX-A-LEAK is very heavy and will sink to the lowest point rather quickly. It must be stirred back into suspension every 4-6 hrs. during circulation of water. 4. Continue to recirculate water until the leak has stopped. 5. After the leak has stopped, give it the proper time to cure (24-48 hrs.). You may then return to normal filtration. 6. Treatment can be repeated if necessary. cleaned. Rinse clean with water. Can cause severe eye and skin irritation. Rinse empty container thorougly with water and discard. Use 1 quart per pool up to 22,000 gallons. Do not use in excess of 1 quart per 5,000 gallons of water. 1. Bypass FILTER MEDIA before adding FIX-A-LEAK to water. 2. With pump running, add FIX-A-LEAK slowly through skimmer or in front of any other suction intake. 3. After adding FIX-A-LEAK adjust suction to main drain. If this is not possible, the vacuum cleaner could be usedalternatively, simply by placing the vacuum in deepest part of pool and connect to normal vacuum connection. Set filter valve to normal vacuum position. 4. FIX-A-LEAK is very heavy and will sink to the lowest point rather quickly. It must be stirred back into suspension, either manually using a pool broom or mechnically with a automated pool cleaner every 4-6 hrs. during circulation of water. 5. Continue to recirculate water until the leak has stopped. 6. Mark level of water in pool and check for 2-3 days to determine if the leak has stopped. 7. After the leak has stopped and given the proper time to cure (24-48 hrs.) you may return to normal filtration. *NOTE* Never let cartridges of DE elements be left to dry before they are cleaned. VERY IMPORTANT: After sealing a suction leak "it" is a must to leave suction off the repaired line for no less than 48 hrs. FIX-A-LEAK requires time to cure and harden. If you suspect a leak around fittings inside the pool (such as return fittings) lights, skimmer(s) or steps, etc. Apply FIX-A-LEAK directly to the leak using a squeeze bottle, similar to a ketchup bottle. Allow a minimum of 48 hrs. to cure before starting up circulation. Can cause severe eye and skin irritation. Do not get in eyes, on skin, or on clothing. Harmful or fatal is swallowed. Avoid contamination of food. Rinse empty container thoroughly with water and discard it. FIRST AID: In case of contact, immediately flush eyes or skin with plenty of water for at least 15 minutes. For eyes, contact a physician. Remove and wash contaminated clothing before reuse. If swallowed, drink milk, egg whites, gelatin solution. If these are not available, drink large quantities of water. Call a physician immediately. 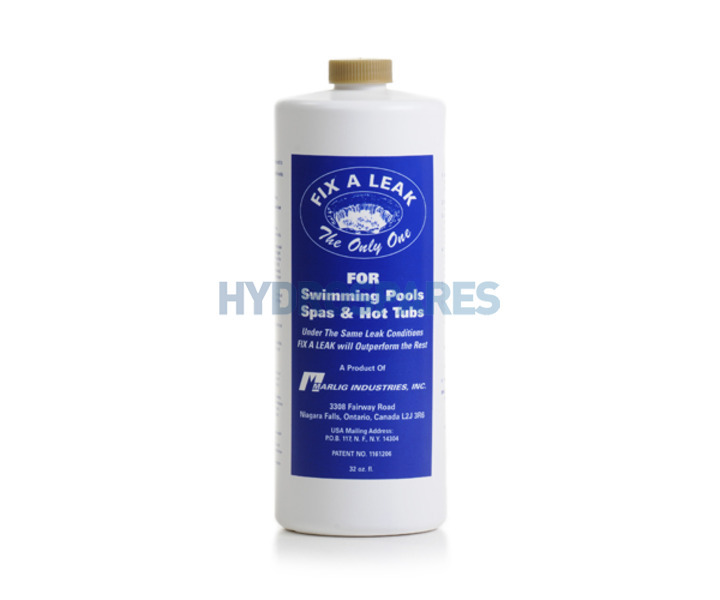 NOTE: FIX-A-LEAK has been thoroughly field-tested under various weather conditions, and has proven to be effective in sealing leaks. this is the second time I have had a leak in a join in the pipework and it fixed it no problem. would recommend. hi, the instructions on the bottle were confusing, but it did exactly what it said it does and fixed the leak at the bottom of my spa. save me a fortune not having to rip it all out. Did exactly what was promised. Fixed the leak deep within the piping and covered in insulation. Result : working tub. Alternative: scrap the tub. If I place an order today ( Sunday 31st May ) will it arrive Monday 1st June if I pay for a next day delivery ? No, unfortunately we dispatch on week days only, so in this case if you select next day delivery then your order would arrive the next working day which would be Tuesday.